There's something really satisfying about making a DIY recipe and seeing results afterwards. Ive always been a fan of homemade face masks but since becoming allergic to normal shampoo about 6 months ago Ive been trying out a lot of beauty recipes in a bit of an effort to reduce the amount of chemicals and nasties I put on my skin. Below are my favourites, some found from research and some reinvented by me. I'm no skin expert/pharmacist though so if you have a concern about using an ingredient then I'd advise just to skip that DIY! Mix 2 tbsp Natural Oats with 4 tbsp water and microwave for approx 30 seconds until the oats become soft and soak up the water, add 1 tsp Honey, one mashed Banana and a couple of drops of Glycerine (available in the cake decorating section of the supermarket or from a chemist). Optionally you can also add a few drops of Tea Tree Oil to calm any blemishes. I also like to add in 2 tsp of Engevita flakes. These are used as a condiment to add a savoury mushroomy flavour to food but are full of vitamins, minerals and micronutrients including high levels of Vitamin B which is brilliant for the skin! (Freederm acne gel is made from a form of Vitamin B). Smear on your face, I would lean over a sink as the mixture is a bit lumpy, and wait for about 20 minutes or so until it dries (avoid mirrors so you don't give yourself a fright) then rinse off. Your skin will feel soft, glowy and toned without being tight. Mix a few drops of Glycerine with bottled water in a spray bottle to make a spray that takes away the powdery look of face powder, and can be used before make up to moisturise the skin (I haven't tried the second as my skin needs mattifying more than moisturising). For oily skin Milk of Magnesia (available from a chemist, I use Magnesium Oxide and water which is the same) will mattify the skin and keep it oil free under foundation. The mixture, especially if you're using magnesium oxide, will need to be shaken well as it separates when left to stand. Don't worry if you look a bit ghostly before your foundation goes on but If I apply too much I remove the excess with a powder brush. Use Bicarbonate of Soda to wash away hair product build up. Mix approx 3 tsp with your usual shampoo for a clarifying effect. Ive used this DIY a lot since becoming allergic to shampoo, I haven't yet found out the exact ingredient I'm allergic to so have stuck with a basic one that leaves my hair a bit dull. I flip my head over and make sure to get right in at the roots! Mix a powder blush or eyeshadow you're not likely to wear (I use bright pink eyeshadows) with Coconut Oil to create a sheer shiny gloss with moisturising properties and a coconut taste. I don't measure each out so its easier to start with a little of the oil and powder and keep adding more of each until you have the amount and consistency you like. The oil is solid at room temperature so the gloss can be kept in a pot or tin like lip balm but quickly melts to a moisturising shine in contact with body temperature. The oil stays glossy on the lips but once it has soaked in still leaves a light wash of colour that wont sink into cracks. The gloss in the bottom right picture above was made with a light pink eyeshadow that had a touch of shimmer, it was a cheapy but works really well as a coconut gloss! Use Bicarbonate of Soda (Sodium Bicarbonate) to brush teeth for instant whitening. Dip toothbrush in the powder, add a little toothpaste and brush, you'll see the results straight afterwards! This is an abrasive way to whiten the teeth so shouldn't be used often and not at all if you have sore or sensitive gums. Make a DIY body oil by mixing virgin Coconut Oil with 1/4 virgin Olive Oil and a drop or two of your favourite essential oil. The olive oil stops the coconut oil from solidifying at room temperature and the coconut oil is easily absorbed to leave skin silky smooth. This mixture is great for legs and dry areas like elbows, also works really well as a barrier on ankles, knees and elbows when self tanning to avoid the product clinging and becoming too dark. My right elbow for some reason turns very dark when I use tanning products but this oil works as the perfect barrier, the trick is to not rub it in completely. 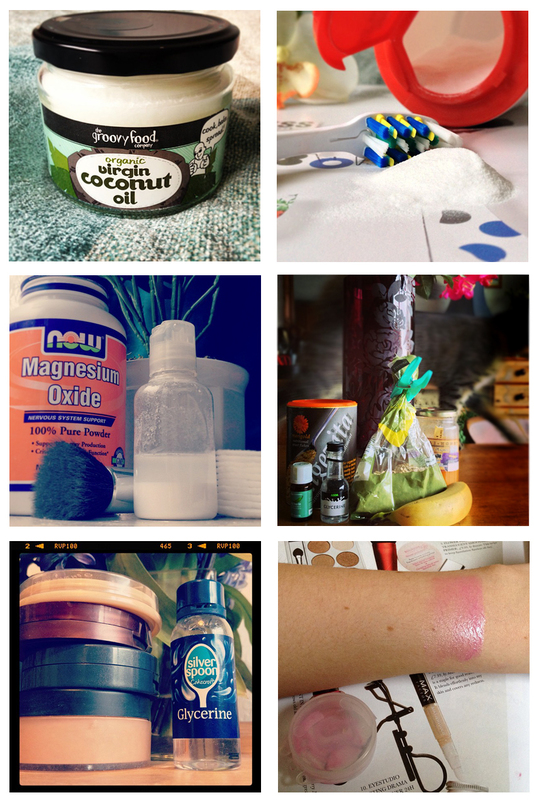 Id love to know your favourite DIY beauty recipes, please tell me in the comments! This is such a great post! Thanks for all the great tips :D I'd heard great things about glycerine, but never knew where to pick it up! Very interesting idea about the lipgloss from Coconut oil. I have made lipglosses using vaseline + an old lipstick but never coconut oil! Great idea!!! This is a really interesting post! I really like the sound of some of those, I'm gonna have to try them out. Especially want to try out the face mattifying one! Great DIY! We love experimenting with products! You posted very interesting DIY tips for everyone to follow! I'm leaning towards the teeth whitening because for my love of coffee, my teeth has yellowish coffee stains. I know that I have to avoid drinks that can stain my teeth, but it's really hard, so I have to religiously bleach my teeth and maybe, I'll try to use holistic DIY methods first because they're cheaper. Wish me luck!